I've always liked the Santastic Christmas slot from RTG. It's lucky for me -- I seem to hit the bonus feature an awful lot! The mobile version made its debut this week so now I can play it on my smartphone or tablet. Yay! Slotastic Casino is giving players up to 150 free spins on the new mobile slot game. The first ten free spins are a no deposit bonus. Use coupon code GOSANTA to claim it today or tomorrow (November 25th and 26th) only. You can get more free spins by making a minimum $20 deposit. Depositing $20 - $49 gets 33 free spins. $50 - $99 gets 66 free spins and a $100 - $199 deposit gets 100 free spins. Players that deposit $200 or more will get 150 free spins. These free spins can be taken in the mobile, download or instant play casino. To claim them enter coupon code MOBILEXMAS when you deposit (valid until December 2nd). 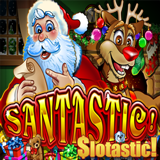 Santastic is a festive 3-reel slot with a bonus round that awards multipliers and free games. Like all games in the mobile casino, the tap-and-swipe version of Santastic has all the features players have grown to love including the Festive Feast Feature where up to 2500x multipliers, jackpot spins or up to 25 free games can be won. Slotastic has hundreds of online casino games from RTG including slots, table games like Blackjack and Roulette. The casino welcomes players from all over the world with a $600 welcome bonus and now offers 25% Instant Cashback to players that bust a deposit without a bonus attached.